FOUR YEARS ago, And So I Watch You From Afar reinvented math-rock with All Hail Bright Futures. This year, they did it again with their fifth album, The Endless Shimmering - they remain the most exciting band in Ireland. 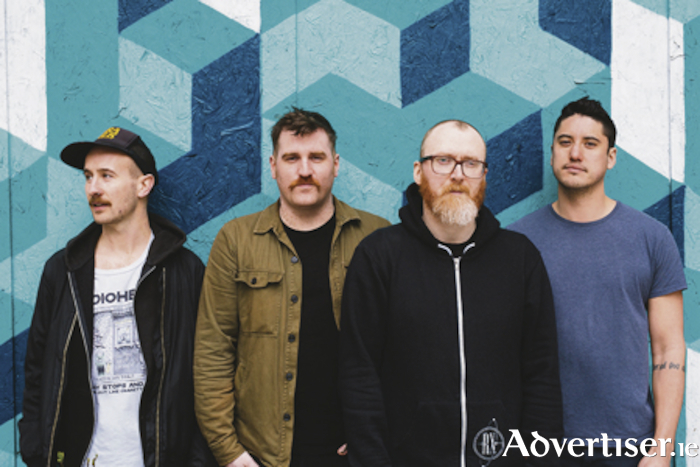 Music from The Endless Shimmering, released via Sargent House in October, as well as tracks from across the band's five albums, will be heard when ASIWYFA play New Year's Eve at the Róisín Dubh (Sunday December 31 ) at 8pm. Not for the Antrim band the usual math-rock tropes of fellahs up on stage practicing their guitar scales ad infinitum, accompanied by skittery, nervous, drum-beats (alongside ASIWYFA, another nobel exception is The Redneck Manifesto ). Instead guitarists Rory Friers and Niall Kennedy, bassist Jonathan Adger, and drummer Chris Wee, delve deep into imagination, ambition, sense of drama and dynamics, to create music that is thrilling, visceral, and unpredictable; virtuosic and accomplished, yet full of soul; epic, yet immediate. Speaking about the album, Jonathan Adger outlines the strong emotional content of the new music. "We laid everything bare and put everything we had into the songs," he says. "We hope people feel that and use that without us having to be to overt in how we present it. The album was charged with a lot of what we were all going through as individuals, but we wanted to allow it to become people's soundtrack to whatever they need in their life at this moment." Support is from Paddy Hanna, Ryan Vail, and Anna Mullarkey. Tickets are available at www.roisindubh.net, the Ticket Desk at OMG Zhivago, Shop Street, and The Róisín Dubh. Page generated in 0.1032 seconds.